Below are common attributes associated to Hannah Chrysanthemum. Become a care taker for Hannah Chrysanthemum! Below are member comments regarding how to plant Hannah Chrysanthemum. No comments have been posted regarding how to plant Hannah Chrysanthemum. Be the first! 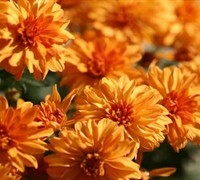 Do you know how to plant Hannah Chrysanthemum? Below are member comments regarding how to prune Hannah Chrysanthemum. No comments have been posted regarding how to prune Hannah Chrysanthemum. Be the first! Do you know how to prune Hannah Chrysanthemum? Below are member comments regarding how to fertilize Hannah Chrysanthemum. No comments have been posted regarding how to fertilize Hannah Chrysanthemum. Be the first! Do you know how to fertlize and water Hannah Chrysanthemum? Below are member comments regarding how to deal with Hannah Chrysanthemum's pests and problems. No comments have been posted regarding how to deal with Hannah Chrysanthemum's pests and problems. Be the first! Do you know how to deal with pests and problems with Hannah Chrysanthemum? When planting chrysanthemums, keep in mind that they prefer well-drained soil and do not like consistently wet feet. 1) Dig holes or beds wide: two to three times the width of the container is good, and no deeper than the root ball. 2) If your soil is heavy clay or very sandy, you'll need to amend it with organic matter to condition the soil and improve drainage. One part organic matter to two parts native soil should be fine. 3) Mums can have fairly brittle stems so gently remove plants from containers, keeping the root ball intact. 4) Then loosen potting soil and roots around bottom and edges of root ball. 5) Place in planting hole making sure the top edge of the root ball is at or slightly above ground level, to allow for settling. Any loosened roots should be spread or facing outwards. 6) Back-fill the planting hole tamping lightly as you go to remove air pockets. 7) After planting, give your mum a good soaking to settle the soil around the roots. 8) Mulch around the plant with a 1 to 2 inch layer of shredded wood mulch or pine straw. You don't have to pinch your mums but, in order to grow a bushier, more compact plant that will bloom on time (during Fall) and produce more flowers, some pinching will be required. Pinching involves the removal of stem tips. Pinching can be done with your finger tips or a pair of hand shears or sharp pruners. If you don't have long or strong finger nails I'd suggest a sharp pair of bypass hand pruners. You can pinch the stem tips on the mums growing in your garden for the first time in spring: when the shoots have emerged and grown to approximately 6 inches tall. Pinch the stem just below the first set of leaves. Beneath where you pinched, new lateral (side) branches will develop along the stem. As soon as these new side branches become 6 to 8 inches long, the tips of these can be pinched. You can continue pinching like this until early July. I usually cease pinching around 4th of July because this is an easy date to remember. For some mums, which I know to be later bloomers, I might pinch a little beyond this time. I usually pinch about two or three times during the season. Newly planted mums that are purchased during the fall season have most likely been fertilized by the grower. Any organic matter or composted added at planting time should suffice for the season. In spring, when new growth begins to emerge, I apply a moderate amount of a slow release flower food. Slow-release is important because you don't want to cause accelerated foliage growth that will result in leggy plants. If your plant become leggy by early to mid-summer, I'd recommend cutting them back by 50 percent or so to encourage a bushier plant that will produce more flowers during fall. If you cut them back in summer, provide another dose of slow-release flower food. Because they contain a natural insecticide, mums have very few if any problems with insects. Root problems can occur if the soil is poorly drained and stays consistently moist or wet. So, when planting mums, make sure to plant them in well-drained soils and beds. Sometimes mums will try to bloom out of season, such as during early- to mid-summer. If they bloom at this time the flowers will quickly fade. If I see buds forming in early summer, and the plants have become leggy, I always cut the plants back by 50 percent or more or shear off the buds on more compact plants. This promotes a bushier plant and heavier flower production in fall; when mums are supposed to bloom.